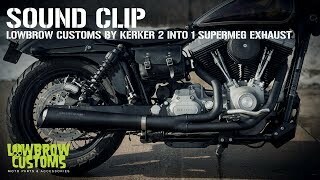 Lowbrow Customs has teamed up with Kerker to bring you an affordable, USA-made, high-performance, 2 into 1 exhaust system for your Harley-Davidson. Our goal was to create an exhaust system we would want to run on our bikes, stripped of all the superfluous covers and branding. We continuously find ourselves drawn to performance race vehicles. Form follows function, and the 2 into 1 SuperMeg is all business. Available in everyone's favorite color, black, this expertly crafted exhaust is available for Harley-Davidson Sportster, Dyna and Softail model motorcycles. The 2 into 1 SuperMeg features a full-flow mechanical core for a deep throaty sound and excellent top end performance. You’ll feel the power curve shift to the top end, providing high RPM power. A 2.5” non-baffle, mechanical core provides a deep, bottomless rumble. The core and packing are rebuildable for minimum maintenance. A uniquely designed mounting bracket makes this system a breeze to install, and all of our 2 into 1 SuperMegs will work perfectly with OEM mid controls or forward controls. Made in the USA. Put this on and the difference was night and day. I have an 01 FXDX 88tc with a K&N intake. This pipe really brought the bike to life. Nice deep quite rumble but as soon as you put some throttle into it, it really roars! It does get a little warm but that was expected with no heat shields. Also the instructions weren't the best but I was able to figure it out pretty quickly. Best bang for your buck out there! Love this exhaust, went from short shots to this, much quieter at idle with a nice deep growl, definitely gets loud when you get on the throttle. Install was very straightforward, had no issues with instructions or brackets, it did get close to my rear master cylinder but just barely clears it. I wrapped the pipes for heat protection/aesthetics. They're not the prettiest pipes but they look good and the muffler is finished nicely. Definitely a solid choice if you're looking for something different than the rest, with some performance boost to boot. Absolutely love the exhaust, sounds great and gave her a little pep in her step. Only issue I have is the mounting bracket needed to be modified to accommodate the rear master brake cylinder, also where the two mounting studs are the bracket is too thick for the studs and doesn't give enough room to thread on the bolts. luckily there is one you bolt in the transmission case the holds it in place, also the mounting bracket that holds it in place in the front is too short and can't be used at all, outside of the brackets the exhaust itself is awesome and I love the overall performance. will this exhaust fit my 91 fxrs with forward controls ?